Background: This study aims to compare the antimicrobial activity of theobromine and two commercially available kid's fluoride toothpastes. Materials and Methods: In this in vitro study a chocolate-based nonfluoride toothpaste, Theobromine (Group A) and two commercially available kid's fluoride toothpaste, Kidodent (Group B), Colgate kids toothpaste (Group C) were used in this study. 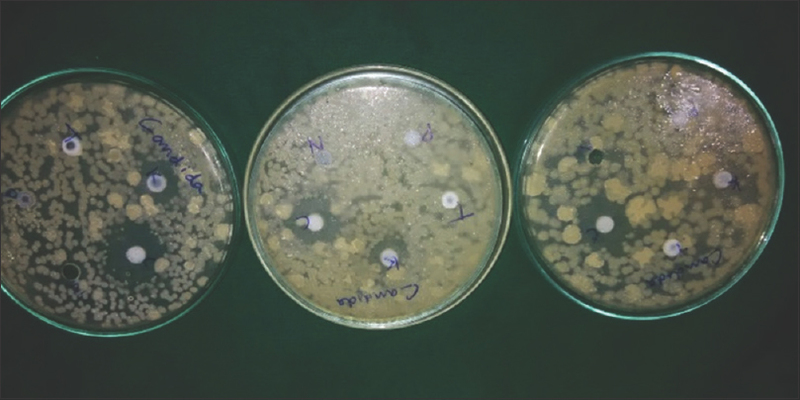 Freeze-dried stock culture of the strains of Streptococcus mutans, Lactobacillus acidophilus, Enterococcus faecalis, and Candida albicans was cultured in their respective selective media. Dentifrices were added to the wells punched out in the culture media and incubated. The zones of inhibition were measured to find out the antimicrobial activity. all data statistically analyzed SPSS using Kolmogorov–Smironov and Shapiro–Wilk's tests. one-way ANOVA was done and Turkey's honest significant difference post hoc test was done for pairwise comparison P ≤ 0.001. Results: Theobromine showed a greater zone of inhibition, which was statistically significant when compared to other two kid's fluoride toothpastes. 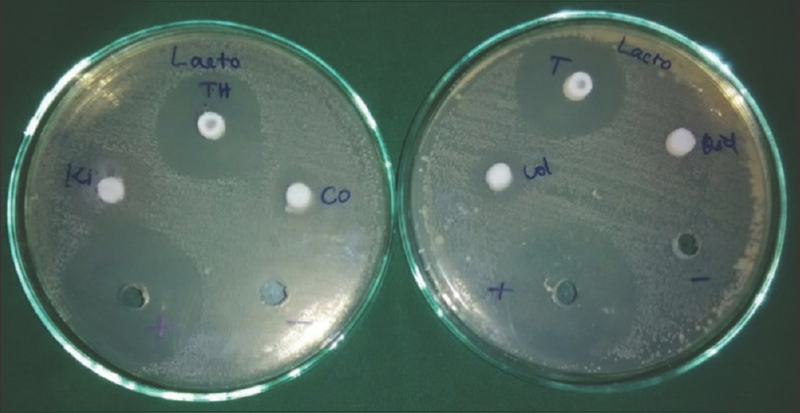 Conclusion: Theobromine shows more antimicrobial effect against S. mutans, L. acidophilus, and E. faecalis, whereas almost a neutral effect with C. albicans. Theobromine though nonfluoridated toothpaste showed greater zones of inhibition than other commercially available fluoridated kid's toothpastes. The Mueller–Hinton's agar was used to demonstrate the antimicrobial effect on aerobes. Three wells were prepared (4 mm in diameter and 3 mm deep) using a sterile metallic template. The agar plates were streaked with the each stock culture microorganisms. Each stock culture contains S. mutans, L. acidophilus, E. faecalis, and C. albicans. Using a sterile spoon excavator, 20 g of Theobromine (2%–4%) toothpastes was dispersed into the first well, 20 g of Kidodent toothpastes (495 ppm) was dispersed into the second well, and 20 g of Colgate kid's toothpastes (500 ppm) is dispersed into the third well. These plates were incubated at 37°C for 48 h. After incubation, zones of inhibition were examined, which appeared as a clear, circular halo surrounding the wells that contained the dentifrice [Figure 1]. Diameters of the zone of inhibition were measured with Hi Antibiotic Zone Scale. The mean diameter of the zone of inhibition (in mm) represented the inhibition value of the tested product. The test was repeated six times in triplicate to overcome any technical errors that might have occurred during a single attempt. Measurements were tabulated and subjected to statistical analysis to know the significance. Figure 1: Zone of inhibition observed in Lactobacillus acidophilus for toothpastes using Muller–Hinton agar. Theobromine (Group A) showed greater zones of inhibition which is higher antimicrobial activity against S. mutans when compared to Kidodent (Group B) and Colgate kids toothpaste (Group C) which was statistically significant, [Table 1] while comparing Group A with both Group B and C, Group A shows greater zones of inhibition which was statistically significant [Figure 2]. Whereas, when comparing Group B and Group C shows equal zones of inhibition which was not statistically significant [Table 2]. Figure 2: Zone of inhibition observed in Streptococcus mutans for toothpastes using Muller– Hinton agar. [Table 3] summarizes that the theobromine shows higher zones of inhibition in L. acidophilus when compared to Kidodent (Group B) and Colgate kid's toothpaste (Group C) which was statistically significant [Figure 1]. [Table 4] summarizes that the theobromine shows higher zones of inhibition in E. faecalis when compared to Kidodent (Group B) and Colgate kid's toothpaste (Group C) which was statistically significant. [Table 5] summarizes that the theobromine (Group A) shows no zones of inhibition in C. albicans when compared to Kidodent (Group B) and Colgate kid's toothpaste (Group C) which was statistically significant [Figure 3]. [Table 6] summarizes that the zone of inhibition observed in Group A was higher when compared to Group B in L. acidophilus which was statistically significant. When comparing to Group A and Group C, Group C shows least antimicrobial effect which was not statistically significant. Similarly, when comparing to Group B and Group C, Group B shows least antimicrobial effect which was not statistically significant. Similarly, the zone of inhibition observed in Group A was higher in E. faecalis when compared to B which is not statistically significant. When comparing to Group A and Group C, Group C shows least zones of inhibition, while comparing to Group A which was statistically significant. When comparing to Group B and Group C, Group B shows least antimicrobial effect which was not statistically significant. Figure 3: Zone of inhibition observed in Candida albicans for toothpastes using Muller– Hinton agar. Bhati N, Jaidka S, Somani R. Evaluation of antimicrobial efficacy of Aloe vera and meswak containing dentifrices with fluoridated dentifrice: An in vivo study. J Int Soc Prev Community Dent 2015;5:394-9. Sudharsana, Srisakthi. Tooth friendly chocolate. J Pharm Sci Res 2015;7:49-50. Srikanth RK, Shasikiran N, Subbha Reddy VV. Chocolate mouth rinse: Effect on plaque accumulation and mutans streptococci counts when used by children. J Indian Soc Pedod Prev Dent 2008;26:67-70. 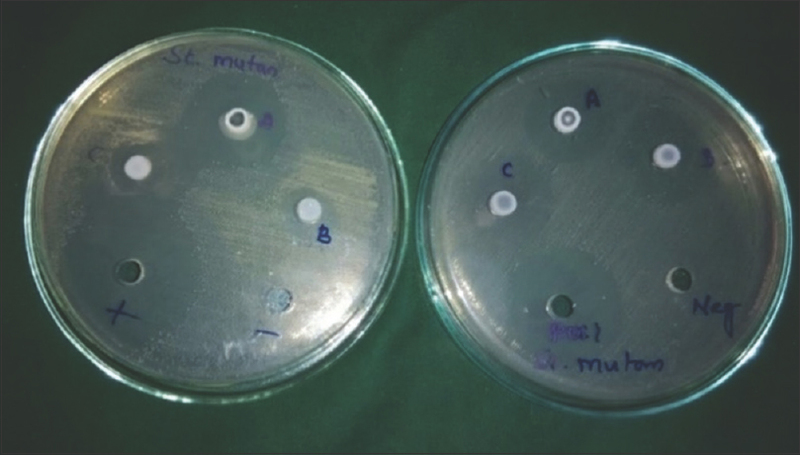 Kamal Badiyani B, Kumar A, Bhat PK, Sarkar S. Chocolate disinfectant: Effectiveness of cocoa bean husk extract on Streptococcus mutans in used toothbrushes. Int J Oral Care Res 2013;1:7-10. Osawa K, Miyazaki K, Shimura S, Okuda J, Matsumoto M, Ooshima T, et al. Identification of cariostatic substances in the cacao bean husk: Their anti-glucosyltransferase and antibacterial activities. J Dent Res 2001;80:2000-4. Tarka SM Jr., Arnaud MJ, Dvorchik BH, Vesell ES. Theobromine kinetics and metabolic disposition. Clin Pharmacol Ther 1983;34:546-55. Amaechi BT, Porteous N, Ramalingam K, Mensinkai PK, Ccahuana Vasquez RA, Sadeghpour A, et al. Remineralization of artificial enamel lesions by theobromine. Caries Res 2013;47:399-405. Arman S. A neural network analysis of theobromine vs. fluoride on theenamel surface of human teeth. Diss Abstr Int 2007;68 Suppl B: 150. Raloff J. Chocolate Constituent Bests Fluoride. Web Edition. Available from: http://www.sciencenews.org/view/generic/id/8545/description/Chocolate_Constituent_Bests_Fluoride. [Last accessed on 2007 May 22]. Venkatesh Babu NS, Vivek DK, Ambika G. Comparative evaluation of chlorhexidine mouthrinse versus cacao bean husk extract mouthrinse as antimicrobial agents in children. Eur Arch Paediatr Dent 2011;12:245-9. Anderson K. Theobromine for tooth decay prevention. eCosmetics & Toiletries Magazins. Schaefer; 2012.